Easy to Use and Easy to Set Medication Reminder for Travel. Practical e-pill CADEX DAILY MedCenter with Pillbox for the Active Individual. Up to 12 Daily Alarms. This e-pill stays with you: Attach this CADEX to your briefcase, purse or backpack, use it as a key-ring or use the integrated belt loop. Your CADEX Alarm Device is attached to a Compact Nylon Case containing your Daily Pill Box. VIDEO How e-pill CADEX works. Easy to Set 12 Alarm Medication Reminder and Medical ALERT. Easy to Open Four (4) Doses per Day Pillbox. 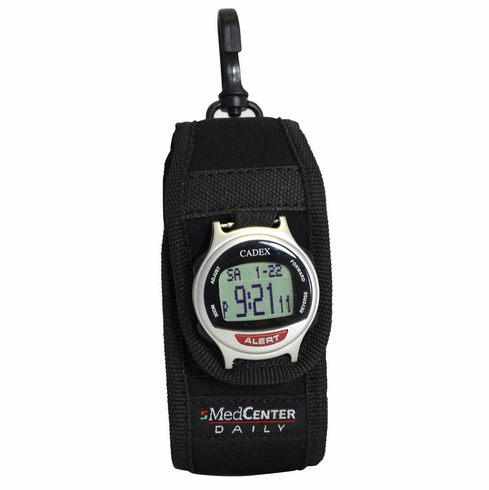 Sturdy MedCenter nylon pouch with Clip and Belt Loop. Program up to twelve (12/day) medication reminders (sound alarm + optional text example 'Topamax'). Reminders and Alarms for meds, tests, insulin, glucose etc. Alarm text scrolls across the display once the alarm goes off. Take all your meds and press the FORWARD or REVERSE button to turn off alarm. Alarms auto repeat the next day - no alarm reset required. Never forget to take your medications again. FREE Standard Shipping & Handling (US customers only). Feel Better. Avoid Medication Errors. Improve patient compliance / Long alarm duration up to 4 hours for each alarm: This easy to use pill timer has a subtle double beep every three minutes until you have taken your medicines. This e-pill also features a practical master switch to turn off all alarms (when you are in church or meetings etc.). Order your e-pill CADEX DAILY MedCenter with Pill Box today! We offer FREE standard Shipping & Handling (U.S. customers only) & a 30-Day Money Back Guarantee. Manufacturer: e-pill, LLC / MedCenter Systems, LLC | 1 Year Warranty by manufacturer (e-pill) | Case constructed of durable nylon (MedCenter). Color: Black Nylon with SILVER CADEX Watch | Battery: CR2032 (replaceable) | Battery Life: About 1 Year | Battery replacement. Daily Pill Box: 4 Doses (cavities) | Pill Capacity: 20 Aspirin sized tablets per Dose. Imprinted Morning, Noon, Evening, Night.